The purpose of the Honolulu Grub Club (HGC) is for a group of friends to explore their love of food together. Here at our blog and website we will share our thoughts, opinions, and ideas about our dining experiences. Last night the HGC had its second event, where six of us gathered on the slopes of Alewa Heights and shared good sushi at Natsunoya Tea House’s new Sushi Bar. We didn’t know if we were going to meet or not due to the tsunami warning earlier, but after a questionable start to the day the night ended with good food and friends. 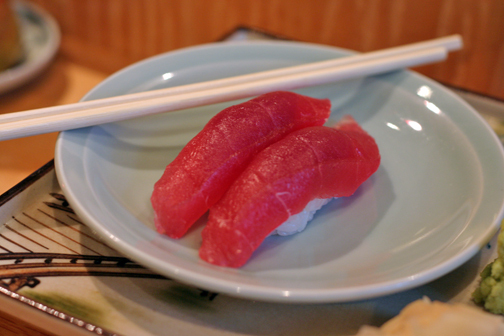 Maguro (Tuna) - The start of a great evening. Similarly, our experience with writing blogs may be questionable at first, but in the end we hope you enjoy our collection of writings and pictures and it is the start of loving our blog as much as we love food.